Good Product, Good Compatibility and Fast Delivery Review by AA "sropqras"
I originally bought this SD Card to use with my laptop and now have used with a few devices, it provides good speed and good compatibility with a number of my devices. Good value for money and prompt service, Review by . N. P. Devas "John"
came quick 2, 3 days Review by Andy Blessed "andy blessed"
As someone who works in film I use digital media day in/day out. Generally I'll use cards far more expensive than this but this one was just for my car so thought nothing of spending a small amount of money particularly due to the hundreds of good reviews on Amazon. The card is excellent value - yes, but it is an absolute lottery as to what you'll get which is why you're paying much less than the equivalent Sandisk. If ultimately it doesn't work or you lose valuable work, is it worth the saving? For me it doesn't really matter, I can just get a new one and I've lost nothing but I'd ask people to steer clear of Komputerbay. People who've used the cards in Canon 5Ds for video and in Black Magic cameras have reported lost work and significantly lower than advertised speeds. They're borderline acceptable for consumer use, but not for professionals. As for the specifics to my purchase. It worked fine for about 3 weeks then when I went to load more files on it accepted them but lost them as soon as the card was ejected (the card wasn't locked). It then refused to be reformatted. I'm sending back for a refund and putting my money elsewhere. I'm delighted with this item. It does what is says on the tin. card Review by Mr. John D. Young "brkyouj"
Excellent value for money Review by Andrew J. Gilchrist "Weeble"
I bought this to add capacity to my Mac book Air. I reformatted it to the Mac Filesystem and it gives me an extra 128GB of space. The only problem is the rubbish design of the the SD card slot on a Mac which means the card sits slightly proud (why Apple can't make it flush like it is on a Windows machine) and this exposes it to damage. The first card got the extending part bent which broke the card (my fault not the card's). So I'm on to my second and have had no other problems. Its fast enough to run a Windows 7 virtual image off under virtual box and the client is still completely useable. Otherwise I just use it for media and presentations and for that it doesn't add any more delay than getting stuff off the built in SSD. Well, I've purchased many storage cards from Komputer bay, i was initially anxious because of the large amount of fake cards in circulation. But after being stung buying a Sandisk and it being rubbish, i took a risk and bought a Komputerbay card...needless to say, it's been brilliant. I've also got a 64GB SD card from komputer bay i bought for my pad, same story there and a 32 GB Micro SD in my phone...same story there! BTW those of you wondering, it conforms fully to Class 10 / UHS-1 standard in terms of speed. I've been using this in my Sony Vaio Duo 13 to double the native memory. After reading few good and few bad review I decides to try this card. First impression is a speed of card which is not nowhere near as advertise but perfectly acceptable by camcorder for HD recording. I fill up card with data , deleted after and formatted card several time (as one rewires suggest to not format card after that card is unusable ). I've just done a quick speed comparison between this SDXC card and a 32Gb SDHC my best class 10 card. The Komputerbay card had 12Gb free space and the SDHC card had 11.2Gb free. I copied a 5.5Gb file to both cards. I used the Windows 8 progress dialog to measure the speed - so the results are COMPARATIVE not absolute. 1. Komputerbay SDXC managed 33Mb/s read and 30Mb/s write. 2. The Class 10 SDHC card only managed 20Mb/s write but still up 30 30Mb/s read. 3. Whereas the SDXC card write speed was constant over the test period the other card was very variable over time. The SDXC Komputerbay card is over 50% faster when writing a large file than the tested SDHC card. The SDXC Komputerbay card is about 10% faster than SDHC when reading large files. Konputerbay 64gb SDXC Review by Alan James Cox "homer"
Great product, and for a fraction of the price. I bought 1 of these cards just before Christmas in a bit of a panic as we were going away and I needed a large capacity card for my camera. The product was delivered on time and in good condition. So far it has been working just fine. It's a super product for the price. Why 4 stars? Well, It still annoys me that 128GB storage equates to 119GB when formatted in real terms. As it comes, the card is formatted to the Microsoft spec of exFAT. I bought this card because I wanted a 128GB card at a reasonable price to store my whole music collection to fit to my cars' head unit. It does exactly that. I've used it daily for about a month and it has worked flawlessly. I'm just about to order another one from Komputerbay as a spare/backup. Because I am using this for the car head unit (Parrot Asteroid) the card needed to be partitioned as fat32. Using Linux this was easy to achieve. I used a bootable CD called Hirens. Microsoft makes it very much more difficult to do. Product OK. Why print 64gig capacity when on the properties display it shows max 59gig? Brilliant item - Brilliant price! Review by Martin Prince "DVD & Blu-ray addict"
I would thoroughly recommend this brand of SD card. They represent excellent value and an excellent product. Super value Review by B. R. Dean "barryrdean"
This card is incredible, does exactly what you want and at an extremely low price. I sought out this card after buying the 64gb version for my camera and I was not dissapointed. I use it as an expansion for my laptop as an affordable way to double the storage capacity. Memory Card Review by P.Whitmore W.
No issues with the delivery of the product. No complaints! Review by Pats "Pats"
Got this for my DSLR. Had some worries about the product, but more than 2 months into purchase and usage of this product, I have no hesitation recommending this to anyone wanting to pick up a good SDXC card for their Camera. Good product Review by M. P. Stacey "MPS"
Like many other reviewers it seems, I was scepticla because its not a household name but having ordered 1 card I have now ordered a 2nd because it seems they are as good as any major brand product. Komputerbay 64GB SDXC Secure Digital Extended Capacity Speed Class 10 600X Review by Mr. John Jones "JackTar1942"
I have read reviews regarding this company and have not seen one that criticised their products in any way that concerned me regarding quality or product efficiency. I received a follow-up-to-purchase email from Komputer Bay, however, suggesting that I have been "brave" to risk buying from a "little known company". The email went on to request me to review the product and give it a star rating of my choice on Amazon, which I am very happy to do. This is a superb memory card, hi-speed, hi-capacity and reliable. Good price as well. Make sure the devices you will be using the card in support SDXC card though.... most recent cameras and camcorders do. I chose a card of this capacity as I have a tendancy to lose the odd card when I carry a number of smaller capacity cards around. I wanted a high capacity card that would last me a day whether taking photos or shooting videos. I do tend to download the photos etc to a laptop or tablet at the end of each day anyway, but I have had no problems whatsoever with this card. The speed is such that I have not experienced any buffering delays shooting continuously (with Canon EOS 70D). This card seems to work just as well as more expensive brands that I have purchased. It has a massive 128GB capacity with good read / write performance. No issues have arisen after several weeks - I use the card in my Nikon camera and have used it as a data storage device. had problems getting the data off onto my machine via external card reader.. had to get my dad to pull the images off onto his brand new laptop. very good Review by Mr. A. Poole "podgioli"
Bought this card because I was on a 2 week road trip on the California coast. I needed a card that would be fast and not be worried about running out of space (hate that swapping and changing cards mid-scene). 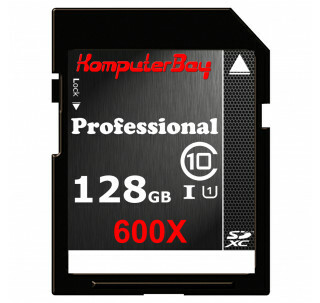 Great value SD card Review by David Pybus "piecrust"
be WARNED: Failed within a week and all photos lost Review by asakhi "hmed"
I ordered Komputerbay 32Gb SDHC fulfilled by Amazon thinking it was a bargain. went to a very impotent event (for me) and took lots of photos. 3 days back in another event when I wanted to take some more photos, there was an error message "memory card requires format". I was so gutted but could not do anything, as I get what I paid for. I recently picked up a Blackmagic Pocket Cinema Camera (BMPCC for short) and needed a very fast SDXC card to keep up with the challenging data rates. It arrived quickly via Amazon Prime and came in a small, plain plastic casing with no packaging at all. I checked it in my USB2 card reader and it was already formatted (exFAT) and ready to go! It also read as 119GB - exactly what I expected! Next, I loaded it into the camera and shot some "Prores" footage with the BMPCC. On checking the footage via the card reader, it paused and skipped. HOWEVER, after transferring the files to my external USB2 hard disk, everything played back fine. Phew! The first thing I did after receiving my card was to download the H2testw 1.4 SD card tester program. Unfortunately, I can't provide a direct link here, but if you google H2testw 1.4, you'll find lots of reviews pointing to the download page. Warning: Only 61303 of 61304 MByte tested. I used a Transcend 3.0 USB card reader that I bought at the same time as the Komputerbay card. The reader has an up to 60 MB/s write and 90 MB/s read specification when using a Transcend 128 GB card - maybe I should've bought a reader with a higher spec 'cos I don't know whether this could have affected the H2testw 1.4 results or not. My card is for a Canon EOS 600D whose write controller has a maximum speed of ~21 MB/s. Consequently, anything that is comfortably above this figure will do for me! My first impressions are that this card is amazing value for the price - obviously, only time will tell how reliable it is. Warning: Only 7571 of 7572 MByte tested. An Excellent card. I 'd definitely recommend it to anyone (very fast read & write). what can I say, It works Review by oisin conolly "DigitalBiscuits.co.uk"
Bought this for my Sony Pro 13 which unfortunately has a very small SSD HD in it. Advertised speeds are, as read again and again, not experienced in real time. I get around 19/20 write. Does the trick for now and is great as an alternative for my small internal SSD. I have just bought this 128Gb SD card to compliment the 128Gb CF card I bought from them last year. My Nikon D800's files are 75mb each so I can almost fill these cards up on a very busy day. I maybe tempting fate but I've had no problems with either of these. Excellent Review by S. Duncan "SED"
I bought the 64GB UHS1 90MB/s card and use it extensively with my MacBook Pro's SDXC slot to transfer large HD video files for editing. Huge storage capacity Review by Mr. N. E. Haslam "Nick Haslam"
OK, So received this yesterday and have been busy testing it fully. Ran h2testw three times - no errors. That's based on testing ALL the available free space. Can't complain, arrived very quickly, seems as fast as some more expensive cards. Only had limit use but like the response, digital transfer speed is good. I was buying a high end Canon camera and wanted to get a fast memory card to go with it. 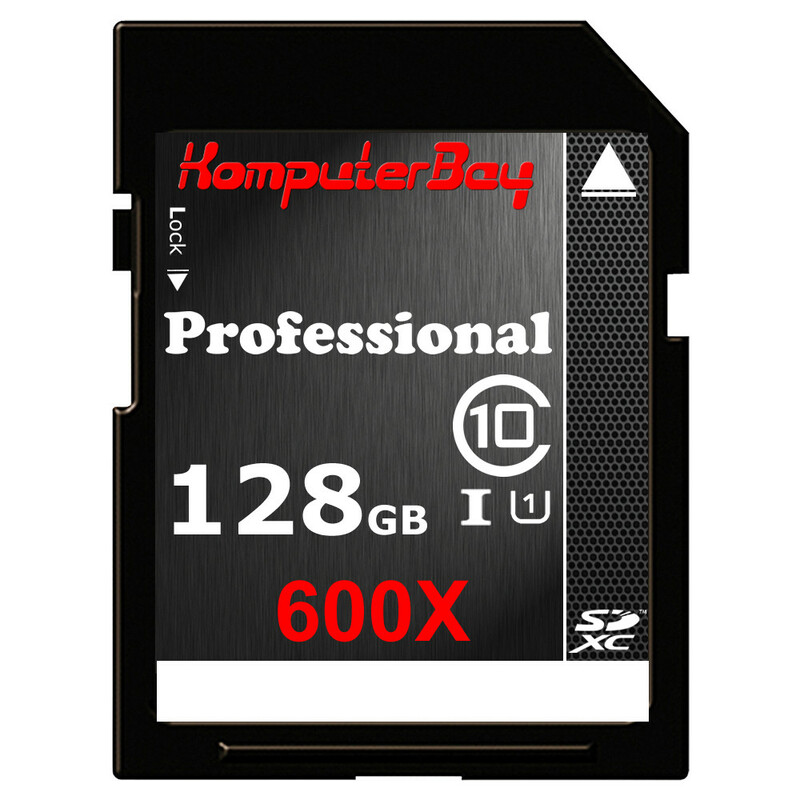 While reviewing the cameras in youtube the Komputerbay card where mentioned buy a professional for its price and speed compared to the fastest card on the market which the the Komputerbay card matched for speed for less that a third of the price. It works Great very happy indeed. This is the review by Tony Northrup professional photographer, quite long review but he uses them. I took a chance and purchased this card. As it was a relatively new brand unknown to me, I thought I would try the product. I' m glad I did! Same performance as we'll known brands I use at a fraction of the price! Help needed on my Komputerbay 32GB SDHC Review by A. C. Machin "fan of Amazon"
Last year i bought a number of compact flash cards of this same brand and from this supplier for my pro slr cameras and have no issues with the demand placed upon them either on speed of writing or quality, easily able to keep pace faultlessly. So i just purchased some more sd cards of the high speed variety for my backup compact and zoom cameras of the same brand,which i haven't used yet, but expect them to perform in the same manner. However, the service remained as efficient as previously.